Develop, be challenged and have fun in the bumps! Many skiers learn to carve and go fast but have great difficulty descending terrain that has been carved out for them – BUMPS!! To ski bumps you need to have the tools available to you that you know will work. These tools will provide you with the control you need, gradually building your confidence and your skill level in one of the hardest terrains on the mountain. This course will certainly help you be more confident and will give you the tools to descend bumps that previously you may have avoided. There is no magic other than simple, sound techniques that will give you the confidence to control your speed in the bumpiest of conditions. 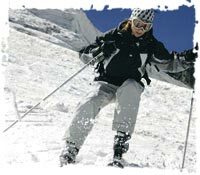 Given the right tools skiing bumps will not tire you but energise you to search for more!